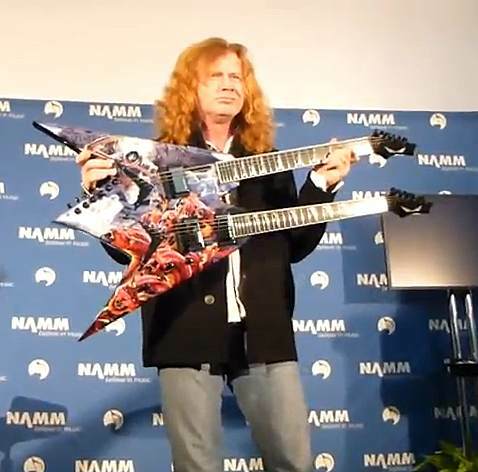 Megadeth frontman Dave Mustaine was on hand at this year's NAMM (National Association Of Music Merchants) show on Wednesday at the Anaheim Convention Center in Anaheim, California, to show off his new Dean double-neck guitar. Originally a one-off which was built for Dave to play at the "Big Four" shows, the guitar will go into full production this year. Mustaine said the guitar "plays like a mother." "When I went to Dean, I found out that the guitars were very responsive," said Mustaine. "And one of the most important things was the attention to detail. Also the relationship with me as an artist. Because the previous companies I was with, the guitars were good, but the relationship was sour. And I found that being with Dean was really good for me, because they took care of me as an artist, they took care of the guitars, they also knew what the public liked." "Those of you that are distributors, you know that the younger generation, they want guitars that look cool and play great, that are affordable and that icons use,” he continued. “For me, I'm flattered to be considered an icon, but I'm just a guitar player. And to have this kind of backing and support from a company that is as reputable as Dean is really flattering." Megadeth are currently in the studio with producer Johnny K working on their 14th studio album.